In addition to his role at Victory, Jim Simpson is an operating partner at Virgo Investment Group in San Francisco. He served as New Jersey State Commissioner of Transportation for over four years during such historic events as Superstorm Sandy and Hurricane Irene. 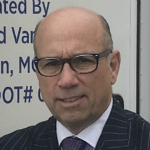 He has been called a “transportation rock star” by the Associated Press and “General Jim Simpson” by the Star-Ledger for his leadership style. Mr. Simpson served President George W. Bush as the head of the Federal Transit Administration, and the governor of New York as a commissioner of the state Metropolitan Transportation Authority. He has served on numerous nonprofit public and private boards in the New York City region. Mr. Simpson is an accomplished pilot, motorcycle rider and recreational cross-country tractor-trailer driver.